No one likes a party crasher. They come in and they have such presence, such clout that they walk in as if they own the place and then begin to move about as if they belong. Such men have great hubris. For the past couple of days, many worried people have been asking me about Rick Warren being on stage at the Tribute for Pastor Chuck Smith on Sunday, October 27th at the Honda Center. Many people know & understand that some of Rick Warren’s ministry & teachings do not line up with God’s Word and what Calvary Chapels stand for. So YES, it was VERY odd to see Rick Warren on stage at the memorial for Pastor Chuck Smith. The question in my mind is this… “Which one of the Calvary Chapel Pastors invited Rick Warren to be on stage at the Memorial?” As I asked around I came upon something very interesting… Rick Warren was NOT invited to be on stage at the memorial, he showed up unannounced and took a seat on stage… actually, he took Pastor Bob Coy’s seat on stage and remained on stage for the rest of the service. 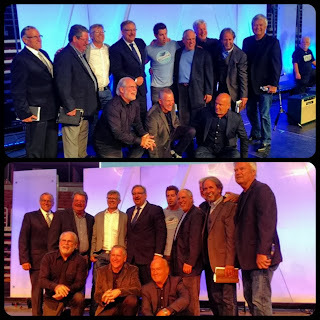 He even butted in on the Group Photo of all of the Calvary Chapel Guys after the service, placing himself in the middle of the group, right next to Brian Brodersen. Now, this is not the first time Rick Warren has “Party Crashed” a Calvary Chapel event. 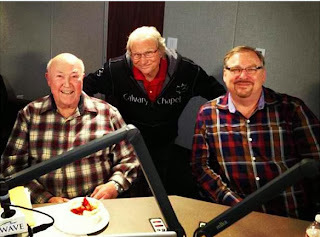 On February 27th, 2013 Rick Warren showed up again at the KWVE Studio during the Pastor’s Perspective Radio Show on KWVE unannounced & uninvited. From my sources & also from Pastor David Hocking, Rick Warren Walked through the front door, asked the manager in charge if this was the way to the studio, walked right in and took a seat. 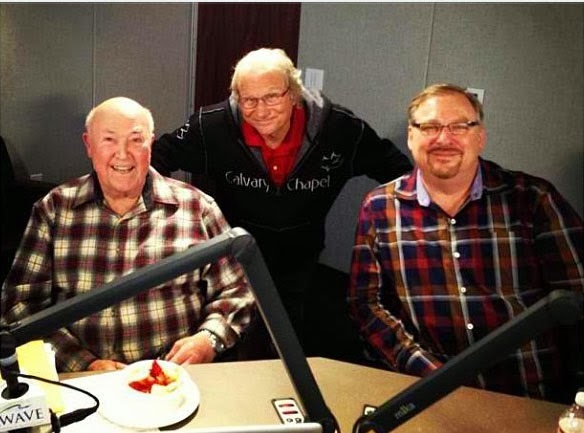 If you listen to the broadcast you can hear the shock in both Pastor Chuck & Don Stuart’s voices, but you can also hear the God Given Grace that they had towards Rick, not wanting to embarrass him on live radio. Very odd indeed, but absolutely true. In light of these facts, I have MANY questions: What possesses Rick Warren to do these things? Why does he feel like he must inject himself into these Calvary Chapel forums? If I am wrong, then which Calvary Chapel Pastor is inviting him on stage? 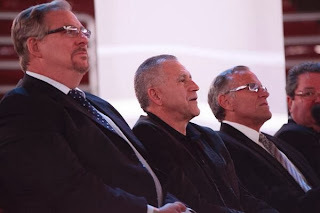 Also… while we are on this point… who invited Reformed Theology Gurus Mark Driscoll, Alistar Begg & James MacDonald to film videos for the memorial as well as Rick Warren? "If I am wrong then which Calvary Pastor is inviting him on stage?" Also on stage and not Calvary: Tom Stipe. Type in their names together with Rick Warren into google. You'll find what you need. I agree, I believe Greg Laurie to be the strongest suspect as I recently heard him give the message at Saddleback Church praising Warren (among other outrageous statements)! Whoever it is ought to be ashamed! This is ridiculous! Hm. Driscoll shows up uninvited at other people's events too... could they all be using the same playbook to push their unbiblical agendas? God bless, when asked about Rick Warren, Brian Brodersen would say Rick Warren was the furthest thing from being emergent. Brian would always defend Rick at the School of Ministry. He also defended the perverse languaged Mark Driscoll a few times and encouraged Costa Mesa staff to come alongside Mark Driscoll's Mars Hill church. I'm convinced there will be only a few Calvary Chapels that wont compromise. I've observed many that were already compromising while Chuck was alive and I can only imagine how worse it will get. Greg Laurie is my guess . . . he "guest pastored at Rick Warren's church after his (Rick's) son passed. Perhaps it was Pastor Bob Coy who invited him to take his seat on stage? I spoke with Pastor Bob in 2007 about the Purpose Driven and Emerging Church books that his church was selling in his bookstore and Pastor Bob told me that he had recently had a long phone conversation with Rick Warren, during which Warren told Coy, "I can't understand why Calvary Chapel Pastors don't like me." Pastor Bob told me that his reply to Rick Warren was, "I don't understand it either." Mark 9:39 But Jesus said, “Do not forbid him, for no one who works a miracle in My name can soon afterward speak evil of Me. 40 For he who is not against us is on our[a] side. Clearly Rick Warren is trying to increase his standing in the minds of Calvary Chapel people. This of course is not a good thing, as he has been promoting the Emergent Church Movement for some time now. Perhaps now would be a good time for Calvary Pastors to revisit Pastor Chuck's "Parson to Parson" letter to all Calvary Pastors, where he said that if you want to "go emergent" to change your name and stop being a Calvary Chapel. It isn't about Calvary Chapel being the only right church, but taking a stand against false teaching. I'm amazed that more people are not asking questions about why RW was on stage in light of Pastor Chucks stance on the Emergent Church & User Friendly Movements which Rick Warren is at the forefront of. I agree with Andrew. If you are not asking these questions then either you don't know much about Rick Warren and his teachings OR you just don't care that much about the faith. Shouldn't be amazing at all. This is a matter of doctrinal integrity. If doctrinal integrity isn't important then explain why Paul wrote the epistles that warned about doctrinal compromise. The fact that Rick's presence caused this backlash, and he knew it would, demonstrates why he should have avoided having his mug on display at the memorial. Unnecessary provocation is evil to the core. This deliberate self promotion is the essence of PDL and his PEACE plan as a whole. Those who exploit these occasions and those who grant them access have perpetrated evil. 2Jo 1:9 Everyone who goes on ahead and does not abide in the teaching of Christ, does not have God. Whoever abides in the teaching has both the Father and the Son. 2Jo 1:10 If anyone comes to you and does not bring this teaching, do not receive him into your house or give him any greeting, 11 for whoever greets him takes part in his wicked works. God is clear: reject the man who welcomes in a wolf. THAT is love for God, Scripture, and the souls of His sheep. True biblical love can never be divorced for biblical Truth. The video clips from the reformed guys added nothing to the memorial. They did however serve as a thumb in the eye to CC Pastors who are trying to remain Distinctively CC. So this deliberate provocation to those people is evil and someone(s) on the council went ahead with it in spite of certain reaction. Blurring the lines is the norm in the modern church and sadly has advocates in higher positions in CC. Count me as one who wishes no ill will towards the neo reformers but for goodness sake draw the line and don't sow confusion. That stunt at the memorial was not honoring Chuck's legacy it was an offense against it. Rick Warren wonders why Calvary Chapel pastors don't like him. Could it be be what emergent church promotes and how they handle the Word of God---separating Christians from the Word of God. Could be because he is also a member of the Council on Foreign Relations and what is his role with them in relation the American church. I just hope pastors of mega churches are aware of this and consider who Rick Warren actually is. The President of Publishers Weekly,George Slowik Jr., verified to me by email they did not publish anything resembling Warren's boast, that his PDL book is the "biggest selling non-fiction hardback book in history." And CC Pastors are smart enough to know that bogus statement is easily refutable. It saddens me that we as Calvary Chapel Pastors are becoming a bit like the Scribes and Pharisees when dealing with people who are not like "us." Rick Warren does not need to increase his reputation by Party Crashing. I am sure he genuinely wanted to express his appreciation for Pastor Chuck. As we know who we are as a movement we will not fear those who are a little different from us. In fact, we will embrace those we can, and pray for those we can't. Those of us in our movement should help others to understand what Pastor Chuck taught us: "Love is the supreme manifestation of a life in Christ." We have so much in common with Rick Warren. Yes there are issues we disagree on...but Rick is a brother and came to express his love and appreciation for our pastor. As Calvary Chapel churches and pastors let's not be known for who and what we are against but for continuing the model pastor Chuck gave us and for being genuinely loving people towards others we may disagree with..
Hey David, thanks for the comment. First of all, it saddens me, as well, that Calvary Chapel Pastors are not taking a stand against variant teaching that is seeping into the Church as well as CC's. And if they do take a stand against it, they are labeled at Scribes and Pharisees, so sad. Before you defend Rick Warren, I hope that you have studied all that He has taught and all that he stands for in his ministry. There are things and certain doctrines that we agree on, but there are so much more where we don't. Question: How much false doctrine are we as Pastors suppose to tolerate in our own lives and in the lives of the sheep that God has given us to teach before it becomes wrong or before it become dangerous for the sheep? This is not about someone being not “like us”, this is about good sound doctrine that comes from God and horrible false doctrine that comes from the enemy. As for the Party Crashing thing… it is a fact that he crashed the Radio Program and it seems that he did it again with the Tribute. Which is VERY odd indeed and rude. I put calls in to many people at Saddleback and I have not heard back as well as the new leadership at CCCM… no response. Many people on stage were shocked that he was up there, and were confused why he was up there. As well as many pastors in the pastors section and across the country. If I am wrong, I will write a retraction, but I also want to know who invited him, if he was. You said, “We have so much in common with Rick Warren. Yes there are issues we disagree on...but Rick is a brother and came to express his love and appreciation for our pastor.” Again I ask, where is the line? How much are we willing to tolerate in the area of false doctrine that he propagates. True, not everything he says is false, but there is much that is and it doesn’t line up with good biblical doctrine. As for Calvary Chapels, TRUE, Chuck did teach us that "Love is the supreme manifestation of a life in Christ. ", but he also taught us MUCH about TRUTH and the Speaking forth of TRUTH, and standing up with Love in our hearts against false teaching and teachers. Actually, Standing up and speaking out against such things IS LOVE!  Love & Truth are Siamese Twins! You can’t have one without the other. Also, Chuck made it very clear that CC’s should have nothing to do with the Emerging Church, which Rick Warren is at the forefront of and Mark Driscoll who is at the head of the Neo-Reformed Movement (who was also invited to participate in the Tribute, which was wrong). As for me and my house, we are going to stand up and speak against harmful doctrines which were promulgated by people like Rick Warren & Mark Driscoll.